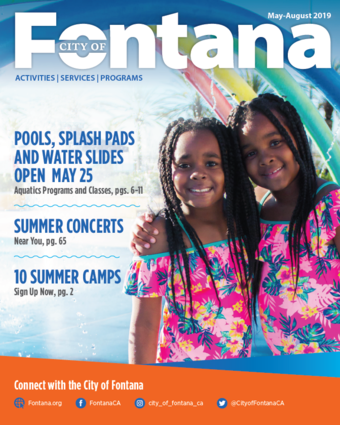 Fontana, Calif. - The City of Fontana is your destination for summer fun. The Community Services Department is proud to release its Summer 2019 Activities Brochure complete with a full line-up of exciting activities, services and programs taking place from May through August. View it online at Brochure.Fontana.org. Brochures were mailed to City of Fontana residents last week and should be arriving in their mailboxes. Copies of the brochure are available at Fontana community centers, City Hall, and the library. May 18, 2019 – Fontana Walks! June 15, 2019 – Fontana Walks! July 20, 2019 – Fontana Walks! August 17, 2019 – Fontana Walks! Two Year Anniversary Reoccurring events (not listed above) include the Fontana Car Show, Dive-in Movies, Family Fun Nights, Skate Nights and the Summer Concert Series. For more information, please visit Brochure.Fontana.org or call the Community Services Department at (909) 349-6900.